, published by Joannes Janssonius, Amsterdam, 1646. He is most widely remembered for accurately plotting the Falkland Islands in 1600. In and around the year 1598, several exploratory expeditions left Rotterdam for eastern discovery traveling in many different routes. On June 27, 1598, a voyage of five ships with 494 men under the command of Jacques Mahu and financed by Pieter van den Hagen and Johan van der Veken, two wealthy Dutch retailers, and equipped by Magelhaanse Compagnie, left Goeree (Holland), bound for the Moluccas, in the Dutch East Indies. They headed Southwest toward the Straits of Magellan in South America, intending to navigate the straits then turn Northwestern toward Asia. The ships with their (initial) captains were: Hoop (Hope), captain Jacques Mahu, leader of the expedition, Liefde (Love), captain SimÃÂ³n de Cordes, second-in-command, Geloof (Believe), captain Gerrit van Beuningen, Trouwe (Faith), captain Jurriaan van Boekhout, and finally Blijde Boodschap (Good Tiding or The Gospel), captain Sebald de Weert. The Blijde Boodschap was better known as Vliegend Hart (Flying heart) prior to this particular voyage. The ships encountered much misfurtune and only de Weert made it back to Rotterdam. Subject: Plate 3 :'Afbeeldinghe van seeckeren Koningh in Guinee'. Depiction of a certain King in Guinea. This plate shows an African King who is being offered a goat. Condition: Size (in cm): The overall size is ca. 24.5 x 19 cm. The image size is ca. 18 x 13.5 cm. Size (in inch): The overall size is ca. 9.6 x 7.5 inch. 7.1 x 5.3 inch. Medium: Original copper engravings on a vellin type paper. ThePrintsCollector Peter Cornelissen, Margo van Latum - van Dongen, Frank van Latum Zeeland - The Netherlands. We guarantee our items to be genuine original. Visit our Store: we would like to invite you to review similar items in our Store or to browse through all other items in our Store. We are confident that you will find very special unique antique maps and prints in our Store. It is our privilege to have you as a customer. 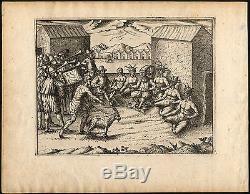 The item "Antique Print-TRAVEL ACCOUNT-De Weert-EQUATORIAL GUINEA-AFRICA-Commelin-1646" is in sale since Monday, October 26, 2015. This item is in the category "Art\Art Prints". The seller is "theprintscollectoruk" and is located in Zeeland. This item can be shipped to North, South, or Latin America, all countries in Europe, all countries in continental Asia, Australia.